In a large bowl, whisk cake mix, pudding mix, and drink mix together. Add sour cream, lemon zest, water, oil, and egg whites to the dry mix. Beat with electric mixer on medium speed for about two minutes. Use a strong mixer, this batter is thick. Scoop batter into 24 lined muffin tins. Bake at 350 degrees for 15-20 minutes until cupcakes don’t look wet and a toothpick inserted in one comes out clean. Allow to cool completely before frosting the cupcakes. Prepare the frosting by creaming butter, shortening, and lemon zest together. Then add lemonade concentrate, milk and vanilla with a mixer. Beat until smooth. Then gradually add the sugar, mixing well until light and fluffy. Beat in the food coloring. Pipe frosting onto the cupcakes. (You will have plenty to pile it on. I had over 1 cup leftover. Leftover frosting is good sandwiched between two graham crackers). Place a lemon candy wedge on top of each cupcakes. With the straws cut the top 1/3 of the straw off just below the flexible part. Discard the tops. Then cut the remaining straw pieces in half. 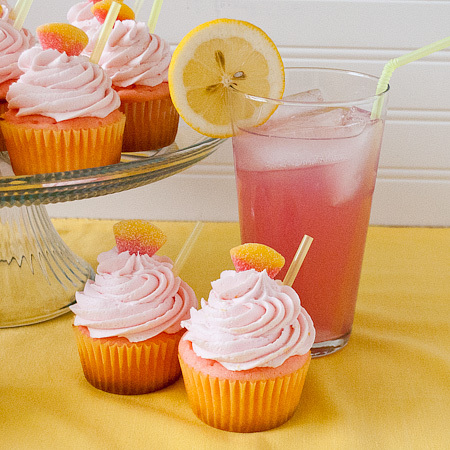 Place one straw piece in each cupcake to resemble a drink. Whenever I try this recipe the cupcake always comes out way too moist, to where it doesn’t cook very well or at all in the center. Do you have any suggestions on how I could fix this. I have made this a couple times and I think I tried it without the sour cream one time and they were a better consistency, but they came out small because there wasn’t enough batter.